CAST Navigation offers the CAST-5000, a GPS wavefront simulator and the only Controlled Reception Pattern Antenna (CRPA) tester that allows full testing of the antenna system, from start to finish. The CRPA antenna, electronics, and the receiver can be tested simultaneously even without the signals. 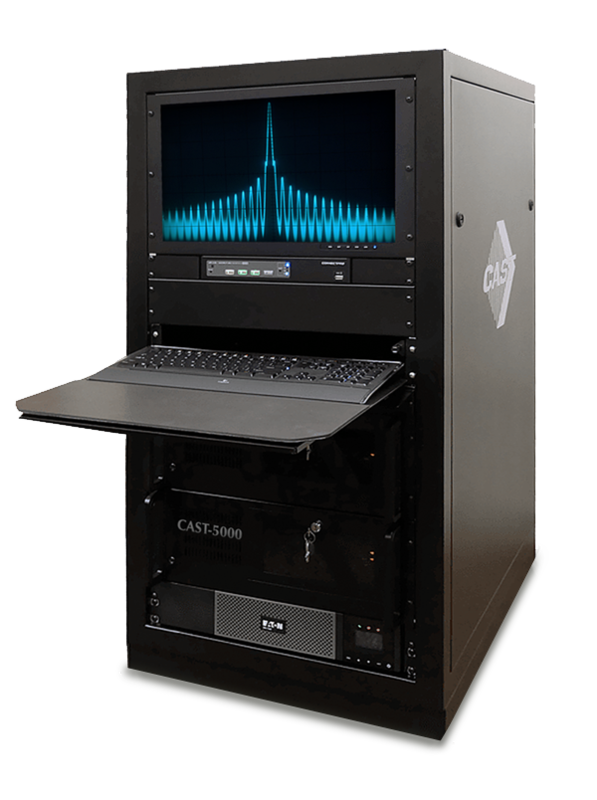 The CAST-5000 is known for its high accuracy and precision in controlled-reception-pattern antenna and attitude determination receiver testing. Producing one clear GPS RF signal wavefront, this GPS wavefront generator for CRPA and attitude determination receiver testing creates four independent simulations that meet in a single point. It boasts a < 1cm intercard carrier phase error. To date, this GPS wavefront simulator is the only CRPA tester that allows full testing of the antenna system, from start to finish. CAST Navigation offers government and military clients the option to upgrade their CAST-5000 configuration to one that features an additional anti-jam testing capability. This allows them to specify interference levels and signal transition characteristics for broadband and narrowband jammers. Our GPS/GNSS 5000 model simply provides a true replica of the signal wavefront under numerous user dynamics. This is important, as GPS satellite signals are vulnerable to interference due to their low power level – around -160 dBW. For many applications, especially in government and military applications, this presents a major problem. With the additional feature of our CAST-5000, interference can be mitigated using a variety of techniques. It ensures the accuracy of a GNSS receiver. Note that because there are numerous external factors that affect navigation accuracy, it is important that the tests be conducted in a lab for controlled and repeatable testing. This allows testers to ensure the design will perform properly both under ideal conditions and under the influence of external influences. The CAST-5000 works by generating GPS wavefront when its GPS RF generator cards are used in a mixed configuration. Each card provides GPS satellites that match the overall configuration; the cards may be used together or separately. The control of the CAST-5000 is simple and allows for versatility and flexibility. 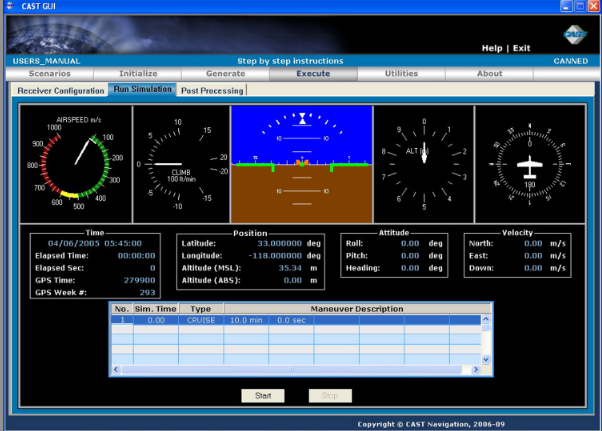 It allows testers to control the user motions and introduces a variety of environmental models. The CRPA GPS antenna model can be tailored, allowing complete control over the navigation messages. Its digital architecture improves reliability, accuracy, and fidelity across a range of test applications. For more information about the CAST-5000 GPS Wavefront Simulator, please call CAST at (978) 858-0130. 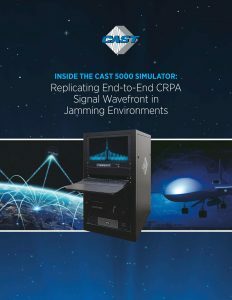 Please fill out the simple form to get your free instant access to our E-book, Inside the CAST-5000 Simulator; Replicating End-to-End CRPA Signal Wavefront in Jamming Environments. The configuration to the right (fig. 1.0) illustrates a system that simulates a wavefront of GPS from twelve satellites for a four-element CRPA. 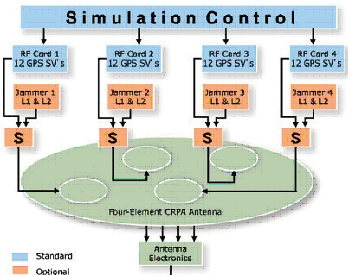 This application utilizes jammers for L1 and L2 as well as twelve satellites for each element of the CRPA antenna.